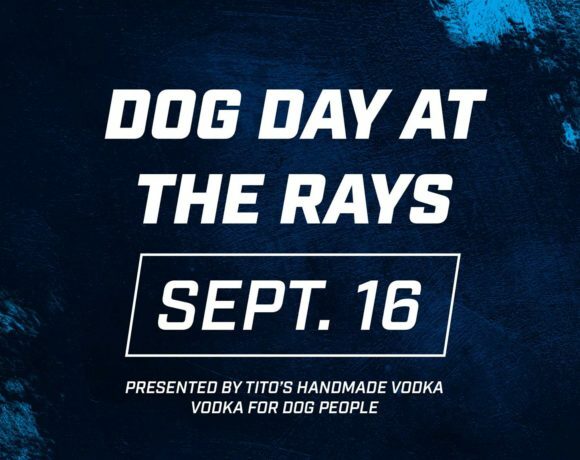 The Tampa Bay Rays invite you and your puppy pal to Dog Day at the Rays presented by Tito’s Handmade Vodka – Vodka for Dog People at Tropicana Field when the Rays take on the Oakland Athletics! For just $30 ($40 value) this specially priced ticket package includes a seat for you and your best pal in the tbt* Party Deck, Rays Dog Day themed item and dog themed activities throughout the game. The Rays Wives will host a pet food and supply drive benefiting Pet Pal Animal Shelter! Fans can donate pet food and supplies inside the Gate 1 Rotunda or outside Gate 6 from 11:30 am until 1:30 pm. Fans who donate pet food or supplies will receive a ticket voucher valid for a 2019 Rays game. Items on Pet Pal’s wish list include cat and dog food, cleaning supplies, cat litter, cat and dog toys, fleece blankets and more. ALSO: Visit the Rays Wives table on the tbt* Party Deck for a charity raffle benefiting Pet Pal Animal Shelter and SPCA Tampa Bay. Raffle prizes include exclusive Rays experiences, autographed items and even Rays Wives dogs favorite things baskets. The raffle will be open from 11:40 am until the end of the 6th inning. Prize winners will be drawn during the 7th inning. Winners do not need to be present to win.